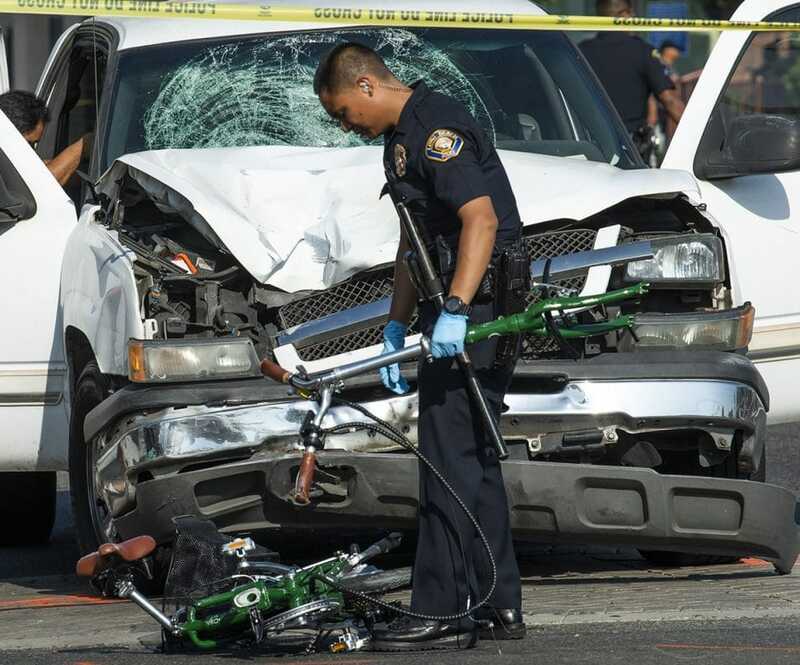 A Long Beach police officer picks up of whats left of a bike after a bicyclist was killed in a crash with a pickup truck at Seventh Street and Martin Luther King Jr. Avenue Thursday morning in Long Beach August 2, 2018. Photo by Thomas R Cordova. A bicyclist was killed early Thursday morning in a crash with a pickup truck at Seventh Street and Martin Luther King Jr. Avenue, Long Beach police said. The crash happened at about 6:35 a.m. near Gumbiner Park—which is just west of Alamitos Avenue, according to authorities. Police said the bicyclist was riding west on the Seventh Street sidewalk just before the crash, but when he neared the crosswalk at Martin Luther King Jr. Avenue, he started riding the wrong way in the eastbound lanes of Seventh Street. 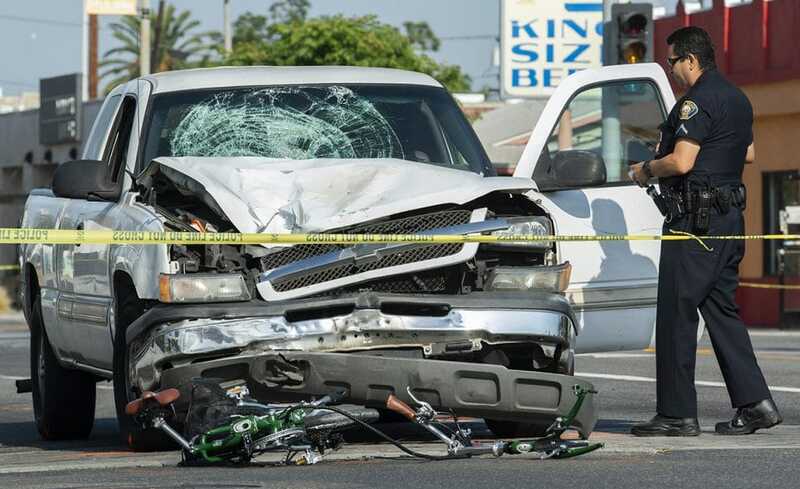 The truck, a 2004 Chevrolet Silverado driven by a 41-year-old Long Beach man, hit the bicyclist immediately after he veered into the street, authorities said. The truck’s driver stopped and started giving CPR to the bicyclist in the bed of the truck, police said. When paramedics arrived, they rushed the bicyclist to the hospital where he died, according to authorities. Police identified him only as a 35-year-old resident of Long Beach. The driver cooperated with investigators, police said. He had a valid license and insurance, and alcohol was not a factor, police said. Witnesses told police the truck entered the intersection on a green light, according to Long Beach Police Department Lt. Melvin McGuire. A Long Beach police officer looks into the cab of a pickup as a bicyclist was killed in a crash with the pickup truck at Seventh Street and Martin Luther King Jr. Avenue Thursday morning in Long Beach August 2, 2018. Photo by Thomas R Cordova. A bike lies on the ground after a bicyclist was killed in a crash with a pickup truck at Seventh Street and Martin Luther King Jr. Avenue Thursday morning in Long Beach August 2, 2018. Photo by Thomas R Cordova. 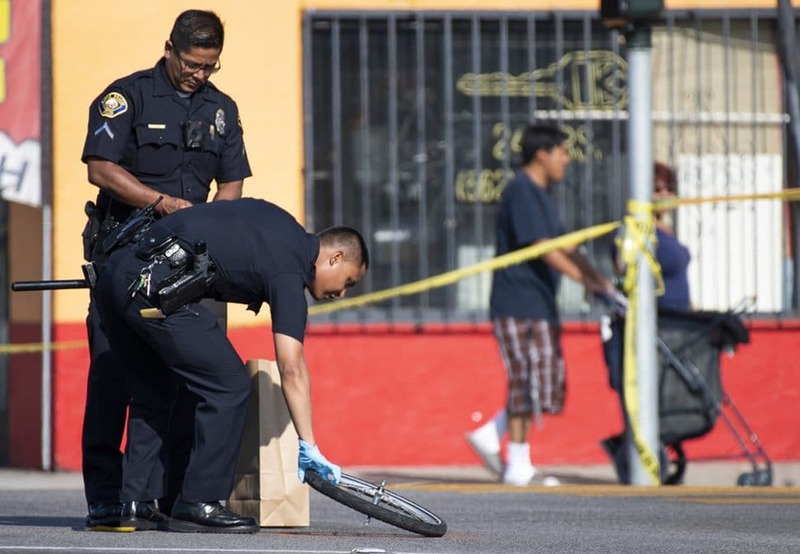 A Long Beach police officer picks up a tire of a bike a bicyclist was killed in a crash with the pickup truck at Seventh Street and Martin Luther King Jr. Avenue Thursday morning in Long Beach August 2, 2018. Photo by Thomas R Cordova. A Long Beach police investigator takes photos after a bicyclist was killed in a crash with a pickup truck at Seventh Street and Martin Luther King Jr. Avenue Thursday morning in Long Beach August 2, 2018. Photo by Thomas R Cordova. 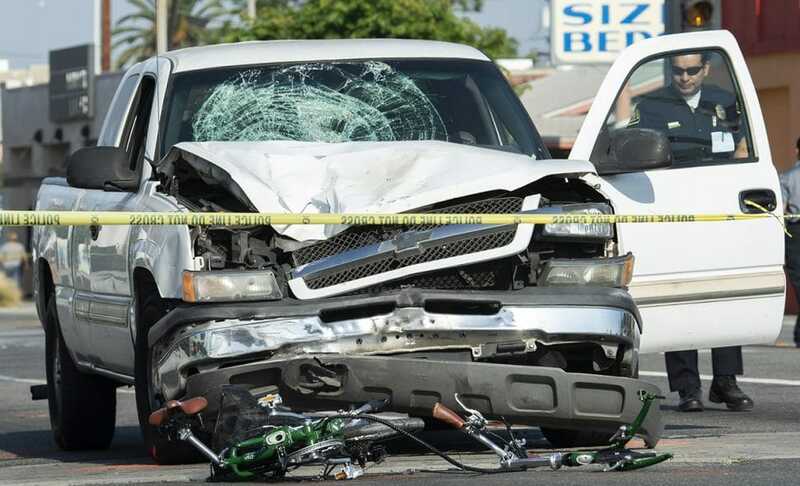 A bicyclist was killed in a crash with a pickup truck at Seventh Street and Martin Luther King Jr. Avenue Thursday morning in Long Beach August 2, 2018. Photo by Thomas R Cordova.